We started Spoil Me Rotten Party Rentals on a whim. We had a belief of starting a great rental company with lots of extras and try our best to bring the best products, great service and the extraordinary rental items. In the process we started doing balloons. We have built columns, canopies, centerpieces, and lots of balloon arrangements from birthdays, weddings and even an angel for funerals. We are very proud to be certified balloon artist, and have the creative minds to help create and design great events. We hope you will choose us for your next event! No matter how small or large we can custom make any part or all of it. We are reasonable in our fees and were are always willing to teach you anything that you might want to make or do for your event. 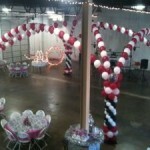 Lisa – She specializes in balloon columns, arches, design and wedding design. She is so energetic and is ready to jump in to balloon design and ready to create the next great design. Donna – Specializes in design and build. She is awesome in the creativity and design. Centerpieces, columns, and canopies are always great with her touch. Tony – Our builder and designer. He makes sure it is secure and ready to go. He can build and design. he specializes in lighting and hanging all kinds of builds. Kristin – In new to our crew but is willing to learn, and has started finding her creativity in design and learn how to build. Rachel – Is our graphic designer for centerpiece photos, sayings and typography. She does wonderful banners with a lot of creative. She can draw , design and make some awesome piece of work. Kate – She is our budget planner, She is always there to help us and keep us on track. Spoil Me Rotten Party Rentals Balloon Mayhem is a premiere balloon decorating company, offering balloon delivery, and decorating services for over 10 years! Spoil Me Rotten Party Rentals Balloon Mayhem has done Grand Openings, balloon releases, themed events, festivals, fairs, arches for races, New Year’s Eve extravaganzas, corporate galas, sporting events, company picnics, college graduations, school affairs, social gatherings, weddings, and more. We provide indoor/outdoor décor for Holiday/Christmas Parties, children’s birthday parties, and Super Bowl Parties. Any celebration, big or small, can be beautifully decorated with a wide array of balloon designs and ideas. From birthday parties to wedding receptions and everywhere in between, our experience spans all regions and we look forward to creating your event. Balloon arrangements, unique gift baskets, and delivery are a part of our service. Same day delivery service is available, but may be limited. From the most intimate to the grandest event, you can count on Balloons Over Washington to create a colorful display. If you are planning a themed event, call our professional staff at Balloons Over Washington to help you create an event to remember. For Retirement Parties, Holiday themed events, children’s theme parties, romantic weddings, and anniversary parties, look to Balloons Over Washington to give you that extra burst of color and excitement with our decorating services. Balloons have always been associated with a fun, carefree, and festive time. What better way to show that your party is a time to celebrate than having balloon centerpieces around the room? If you want a spectacular look when creating your balloon centerpieces, you can’t go wrong with ideas by Balloons Over Washington. Spoil Me Rotten Party Rentals Balloon Mayhem can create a unique and specialized centerpiece for your themed event. 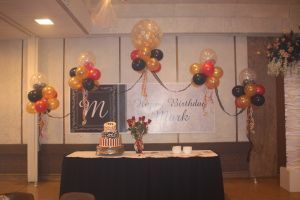 Centerpieces can be made with balloons, floral arrangements and/or candelabras, depending on your custom designed theme. The designs and colors will complement other elements of the decor and purpose of your party, whether it is a Bar or Bat Mitzvah, corporate event, theme party, birthday party, kid’s birthday party, wedding rehearsal dinner or wedding reception. We provide balloon decorating services for the most elegant parties and sophisticated corporate events as well as lavish ballrooms to outdoor parties and events. Balloon centerpieces and buffet arrangements can be customized to your event. Whether you need balloon decorations for a small gathering or a large banquet, we have balloon centerpieces, balloon arches, balloon drops, imprinted balloons and more to decorate your event! Create a festive and colorful setting for your next special occasion with professional balloon décor services from Spoil Me Rotten Party Rentals Balloon Mayhem. The Grand Opening or Ribbon Cutting for your retail store, car dealership, new office building, government facility, university building, aquarium or entertainment center, equestrian park, golf course, country club, community center, sports venue, museum, symphony hall, hospital or event facility is a once in a lifetime opportunity for your business or attraction to shine. This is your time to get favorable publicity by carrying out this public relations opportunity in a professional manner with a lot of fanfare. Spoil Me Rotten Party Rentals Balloon Mayhem can provide you with colorful and exciting balloon decorations to make your event extra special. We have ideas for a customized theme and decor that will compliment that theme. Spoil Me Rotten Party Rentals Balloon Mayhem will exceed expectations for any occasion! Balloon Arches in unique patterns, spiral, or solid colors are available for delivery to you home, school, hotel, party, or business location. Balloon Arches are great for drawing attention and filling large spaces. A Balloon Arch is an excellent way to add drama, excitement and color to your event decor. If you are having a Valentines party, a wedding reception, rehearsal dinner, a birthday party, anniversary, Bat/Bat mitzvah, a sweet sixteen party, consider a heart shaped arch. All other events will benefit from the pizzazz of a balloon arch that compliments the decorations of your indoor or outdoor space. An arch ushers your guests into the party in a very festive manner and accents special features of your decor. An entry arch, creates the ambiance for what is on the inside. 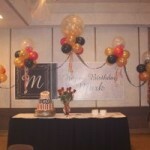 Balloon columns, arches, drops, and giant balloons are frequently used with a Grand Openings. They are usually accompanied by special sales or other promotions and giveaways. The Grand Opening may not be the first time the establishment opens. In many cases a soft opening occurs before the grand opening to allow the staff to become familiar with the establishment and how to operate the equipment. This is very common within restaurants and some other businesses with the Grand Opening occurring approximately one month after the initial soft opening. In some cases, the Grand Opening may be a special event for invited guests. This is very common for restaurants or for other high profile businesses. Surprise someone special with a hand delivered bouquet of balloons. Whether it’s a birthday, a new baby, an anniversary or celebration of any kind, we have the balloons bouquets to make it even more special. Or, when ordering a large quantity of balloons, let us bring them to you or your place of celebration and save yourself the trip. Delivery is available seven days a week throughout lubbock and same day delivery is usually available. Some outlying areas of Lubbock may require an additional delivery fee.